It’s fair to say that the majority of us in the UK take our jobs for granted; the choice between getting up for work or having an extra hour in bed can sometimes be a challenging one. However, if you were physically incapable of going to work then you’d soon start to miss that Monday morning rush. How long would I last without Income Protection Insurance? This is a question every working adult should be asking themselves. As this infographic shows, the results from around the UK don’t look promising. A safety net is vital in the event of illness or injury that puts you out of work, but according to statistics from Legal & General, only a slim 8% slice of the UK population have Income Protection Insurance. 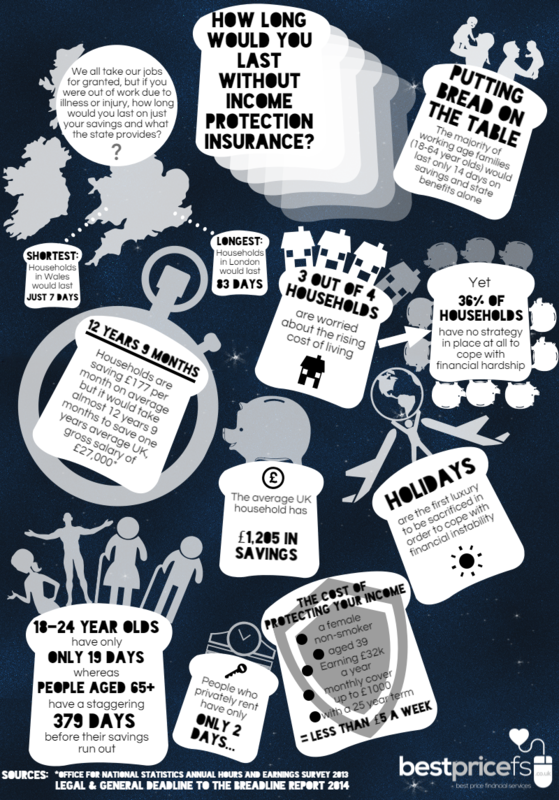 Check out the infographic below and find out more about how families in the UK would fare if just relying on their savings and state-provided benefits. So as you can see, for some of us in the UK, an untimely illness could have a huge impact on not only our long-term health but our financial situations too. However, Income Protection Insurance can help save those money-induced migraines and set you up with up to 80% of your usual income if you fall ill and out of work. Visit our Income Protection page to find out more and get a quote; peace of mind is just a click away.